My Inside Voices: Paint your carpets! I assumed that the worst decision Lily would make today was when she turned the hose on me as I opened the sunroom door, spraying water into the house while giggling manically then racing away with the hose still at full blast as I yelled at her to stop. I guess I figured the time out and loss of cartoons would somehow spur her into considering her actions more. That she'd pause before she engaged in any activity that might be frowned upon, forbidden or in that gray area in between. You know, ask herself, "is this really a good idea?" The fact that she requested a nibble of her chocolate bunny – leftover from Easter – while she was lounging in the time out chair should've given me some indication that the lesson, as it were, hadn't been learned. An hour or so later, I'm squeezing in a little work while the girls play in their shared room for "quiet time." Aside from a few anonymous thumps and low-level chatter, they seemed to be getting along famously. That was until I heard Jovie. "No Lily, I don't want you to paint me anymore!" I stood up from my chair. Horrified. Had I just heard what I thought I heard? I crept over to their room. 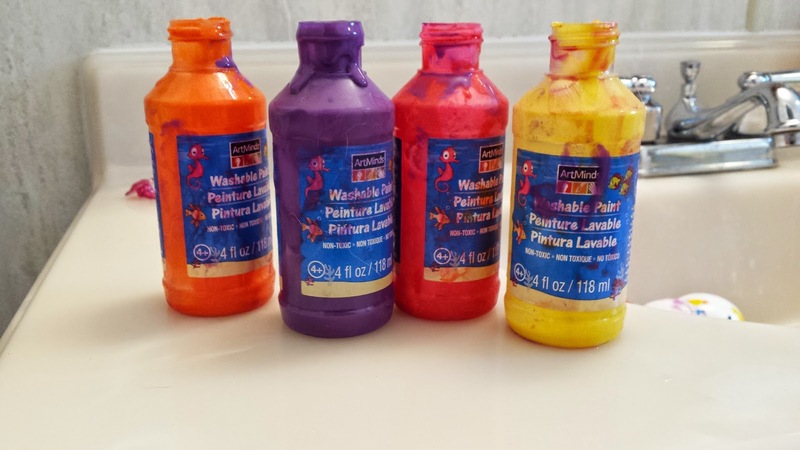 The hallway smelled like an elementary school art class. I paused to collect myself. Then quietly opened the door. Lily, her left eye smudged with red paint, grins at me. "Hi mom! We're painting the room!" 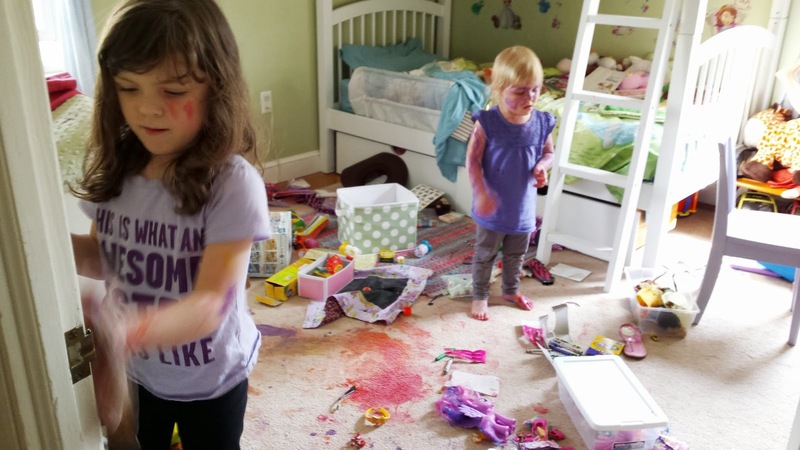 She skips off flicking gobs of purple paint on her walls, the door, the dresser. Like the frost fairies in Fantasia. A sprinkle here. A touch there. Smear some more on bed for good measure. A chair is pushed over to the bookshelf where I stow the art supplies. There are toys everywhere, many of which have been transformed by my little artistic sprite. Jovie's face is covered in purple. Covered. But that was, at least, manageable. "I wanted to make the carpet pretty!" Lily told me. And you know what? The carpet was pretty. The colors were so bright and cheerful. The splatters so playful and fun. 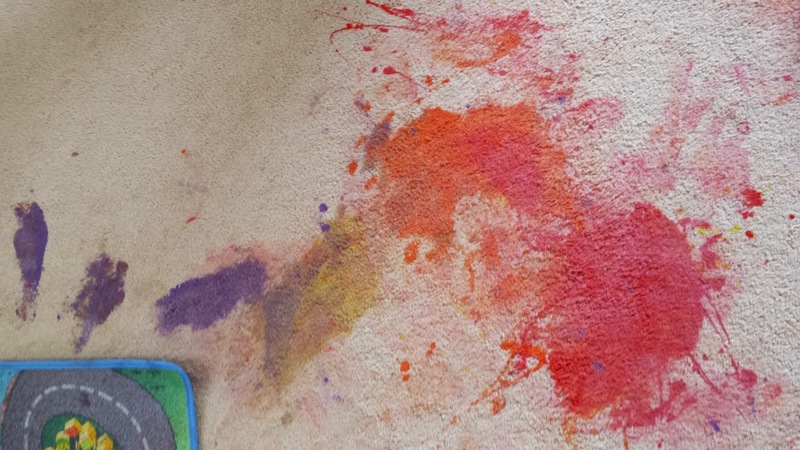 I desperately wanted to be the mom who saw the boring beige carpet covered in paint and rejoiced at her kid's free spirit and creativity and ran for more paint. I wanted to be "Let's finish the job!" mom where the three of us would laugh and splatter paint over this and that like knock-off Jackson Pollocks. And then when we were done with that, we'd race out to the garage and cover my boring silver Moms-UV with more paint. What the hell? Let's make everything pretty! But I'm not that mom. Instead I collected my the remains of my wits. Assessed the damage. 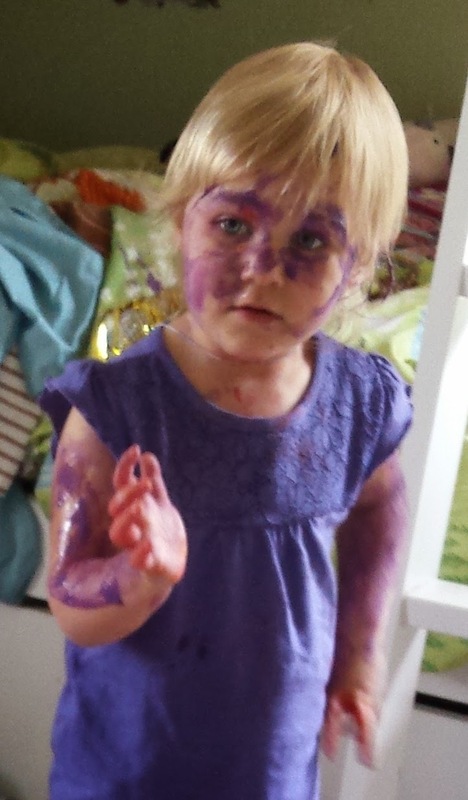 Requested that Lily stop with the paint on everything. Filled the bathtub. Washed the girls. Wiped down the toys. Asked Lily to wipe down the walls. Revoked more cartoon privileges. Stowed all painting supplies. Called the neighbor. "Can I borrow your steam cleaner? Lily painted her carpet." There were no questions asked. What more do you need to know really? 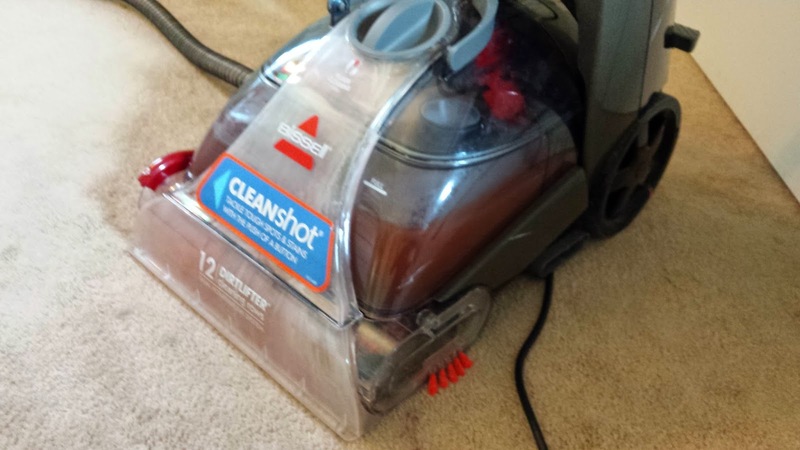 The Bissell ProHeat CleanShot filled with carpet juice. After 45 minutes of steam cleaning, the room still looks like a crime-scene coverup. "I just wanted to make painting land!" Lily told me as she was getting ready for bed. Now, why don't you go ahead and get that hose from the backyard? Looks like we might need it. "The Halfling: The Desolation of Mom"